Plagiarism Checker a tool to get rid of copied article or content and to get higher Google ranks. If you are using duplicate content then you are definitely not going to get the desired SERPs and that is known as a Black Hat SEO technique. Therefore, to generate unique content you have to use the plagiarism detection tool that guarantees 100% satisfactory outcome. So, be careful from the copied articles and improve your rank in the SERPs. Is Unique and Plagiarism Free Content Necessary to achieve high ranking? Unique and plagiarism free content is necessary for a website is as food and water for human life. We can say that unique and quality content is the life of a website. You can understand more accurately if you are a university student. Thieving someone work or copying someone idea is called “plagiarism”. Google and other search engines love unique quality information. If you are a web developer, and building a website then you must need to follow the Google guidelines. The web pages with poor content are maltreated by search engines. Google give only importance to such websites having unique and high-quality information. So, try to create 100% unique, fresh and SEO optimized content, if you desire to achieve top ranking. How FreeSEOTool Plagiarism Checker Works? Our advance Plagiarism tool works very carefully and deeply. Firstly it scans your full article and then checks it from which place it is copied and where the similar article is available. If the tool detects that your text is copied from any website, then it simply shows you the result. It's truly important SEO optimization tool for you if you desire to get a better position of your website. Why You Need Use Our Free Plagiarism Checker Tool? Plagiarism remover tool is generally formed for checking the plagiarism of articles. Any website that is copying any content is risky. If you wish to get better Google ranking, then you must have to use the unique content. If you use any copied content on your website then your website will never get ranked by the search engine and especially by Google. Not only that, it will be one kind of Black Hat SEO. Black Hat SEO is not accepted or liked by Google and any other search engine. So you must have the unique content to use it on the website. If you hire any article writer for creating the unique articles but he copies the articles from different web sources then you can simply check the content duplicate via our free plagiarism checker tool. Our free SEO tool can guarantee you about the 100% perfect result. Our tool also provides the source from which place the article is copied. Sometimes if the similar content is available in the various website, in that case, it will not provide the content source. Because it will obtain long time and we do not want to keep you wait for a long time. So use our free plagiarism tool and try to keep your content unique at least 80-90%. 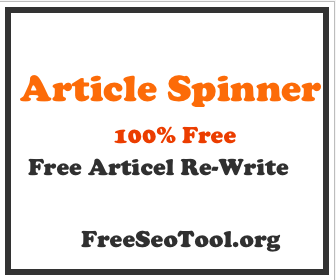 We are also offering article rewriting tool or Online Article Rewriter Tool to rewrite your desired articles.